Fragmented Pink Floyd releases collection of instrumental tracks reminiscent of their past to conclude nearly 50 years of psychedelic rock supremacy. Just as you wouldn’t dig out a corpse from its grave, few would dare to jam with the dead. Nevertheless, Pink Floyd’s remaining members, guitarist David Gilmour and drummer Nick Mason decided to honor founding member and keyboardist Richard Wright, who passed away in 2008, in their latest release. The Endless River draws from extra material recorded by Wright during the 1993 sessions of their previous album The Division Bell. If you admire Pink Floyd for their concept album masterpieces like The Dark Side Of The Moon and The Wall or their lengthy psychedelic gems such as “Echoes” and “Shine On Your Crazy Diamonds”, you’re in for a surprise. Don’t expect too much lyrical songwriting or storytelling but rather endless instrumental jams of ambient music led by the iconic guitar leads of Gilmour, the simple yet pulse-driven drum beats by Mason along with the magically hypnotic piano melodies and synth pads of Wright. Even though, the sound of Pink Floyd is instantly recognizable, a core element is missing. Without Roger Waters, bassist of Pink Floyd since its beginnings in 1965 until 1985, the album tells a discordant story that might as well be used as a film score. The songwriting components, the vocal inputs and bass lines of Waters have been the helpless slivers that empowered a cohesive band as a whole, before this current Gilmour-led era. It is unfortunate to discover that the best bits of The Endless River were used in the album previews shared on social medias prior to the album release, just as a bad trailer would reveal everything there is to see in a movie. At least they can be used as ringtones right away. The album is divided into four movements, each of them strangely and awkwardly familiar to a previous Floyd release, which doesn’t help in procuring the awe that one might expect when discovering new content from a favorite artist. Or would fans rather have them never change musical directions in their careers? The album opens on an atemporal track, naturally confessing its similitude to the beginning of “Shine On Your Crazy Diamonds”. Indeed, “It’s What We Do” suggests both the legacy and the band’s driving force as a mere monotonous activity lacking originality and passion. 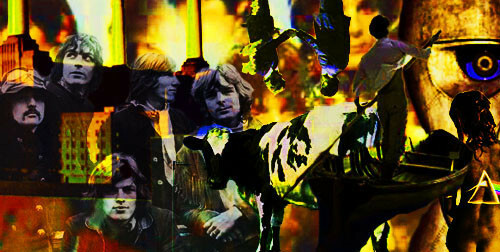 The record then shifts into an interesting odd-time signature synth pattern, but the rest of the movement in “Skins” is full of nostalgia for A Saucerful Of Secrets, an earlier album with a psychedelic vibe influenced by Syd Barrett, one of the founding members and songwriter of Pink Floyd who left the band in 1968 due to mental illness. “Anisina” is simple yet truly beautiful if it hadn’t been for the same string patterns taken from “Comfortably Numb”. The third side, or should I call it the Waters side, replicates two distinctive creative processes from The Wall. The splitting of “Allons-Y” into parts and its galloping pulse coincidently recalls “Another Brick In The Wall” along with the guitar riff that instantly evokes “Run Like Hell”, both of them written by Waters in his 1979 rock opera. Fortunately, the last and best cut of the album “Louder Than Words”, the only non-instrumental track of the release, sets the bar higher thanks to the lyrics written by Gilmour’s wife and novelist, Polly Samson. Although, the song seems to be an extract from The Division Bell merged with the guitar solo from “Comfortably Numb”, one of Gilmour’s finest work often considered one of the best solos of all time, it delivers a clear message with conviction. The Endless River succeeds in transporting the listener through some of Pink Floyd’s distinctive eras as a compilation of old songs or a reissue, but hardly as an album with brand new solid material. Currently in a vulnerable state of collapse, Pink Floyd failed to provide original compositions worthy of their name and missed the opportunity to praise Wright’s work. Overall, the Wright soul is missing.